Back in March we reported the news that Alcon entertainment had purchased the rights to Blade Runner was readying either a sequel or a prequel. Now, Ridley Scott has signed on to direct and produce the next Blade Runner film. Wow. Kosove: "There are opportunities to think about either, what our world will be like in our almost immediate near future. Or to think about what the world is after Blade Runner, because we have things that have come into our being, things that are a part of our consciousness now that we couldn't have imaged many years ago. Deadline confirms that it still doesn't sound like the production company knows what story they want to tell yet exactly, but that the writing process will be the next step. If we had to guess, we'd put our money on the near future mutiny. 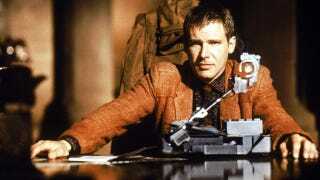 However, since Blade Runner was set in 2019, whatever they film as a prequel will have to be the very near-future. Read the full interview here.